A beautiful desktop depiction of pine, berries, and mistletoe that still leaves plenty of room for icons on your computer! A bold, red Christmas wallpaper that really puts you in the festive mood. A beautiful collage of Christmas decorations with a plain background. Stylish and minimal! Forget the traditional Christmas tree form, this is a close-up texture-style wallpaper of a holiday classic. A beautiful tilt-shift image that shows off a Christmas tree on top of a camper van. At a novel scale! A string of holiday decorations set against a red background. A red string and a collection of star decorations, set against a plain dark background. Just a single Christmas ornament, with a stylish depth of field. Wallpaper simplicity! A super-close-up of one of the most beautiful things in nature — a snowflake. Perfect for your desktop wallpaper. A beautiful little Christmas scene for your desktop wallpaper, with a few Christmas trees and a festive church! A simple snowy tree – even undecorated – can get you in the holiday spirit. This Christmas desktop background is simple and leaves plenty of room for you to actually see desktop icons. The artistic style of this Santa flying through the sky with his reindeer is a grown-up interpretation of the childhood scene. The dark style is beautiful and not too busy for a desktop wallpaper. If asymmetrical balance is your style, this Christmas tree wallpaper features a fun style with lights on a dark background. Not every Christmas decoration has to be red and green. This simple blue holiday ornament emanates holiday sparkle. Gift Delivery is a fun representation of how much time it seems to take for the holiday season to arrive. The desktop wallpaper is sure to be a conversation starts if anyone glimpses your screen. This Christmas desktop background should appeal to all the wordsmiths out there. Not every Christmas desktop background has to be just for the holiday, a fun winter scene – such as this lifelike snowman – can be equally nice. Simple garland on a wood background is eye-appealing and features just a hint of the holiday season for your desktop wallpaper. 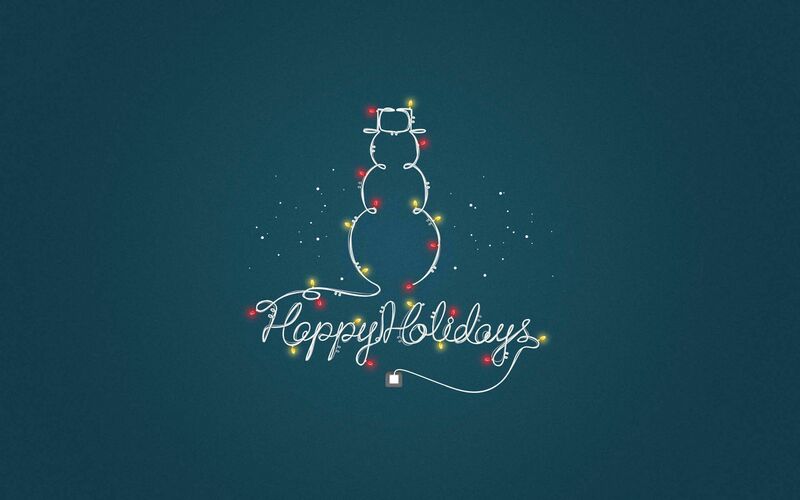 This cool snowman desktop wallpaper features a fun design with plenty of space around it. Great for people that prefer a background without too much going on. An explosion of gifts is every child’s dream. This representation shows exactly that. The texture of this Christmas wall paper is nice and provides plenty of room for visible icons on the screen. It has a bit of a trendy and retro vibe. Move a design trend to a holiday trend. 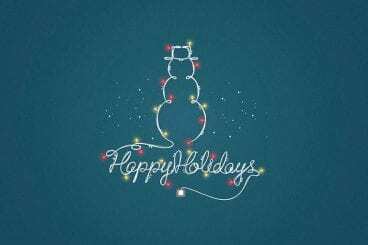 This gradient Christmas desktop wallpaper includes fun color, holiday snowflakes and a cheerful design. A characteristic of the season is certainly sparkle. This glitter desktop background fits the bill. Here’s a little holiday greeting for the devs. Happy New Year is a fun desktop wallpaper to end the holiday season.